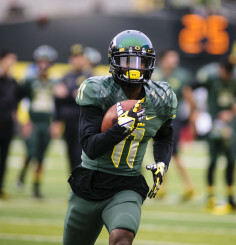 Oregon Wide Receivers, Best Group In Years? I’ve been an Oregon fan for as long as I can remember. I’m 23 years old, so the Joey Harrington era was when I started becoming a real sports fan as a kid. It seems the Ducks have always had good running backs over the years with players such as Maurice Morris, Jonathan Stewart, and LaMichael James. But even with a focus on the running game, the Ducks have had some good receivers, as well. Keenan Howry, Samie Parker, and Josh Huff were all dangerous receivers during their time as Ducks; however, we’ve never had a receiving core as explosive as the one they have now. 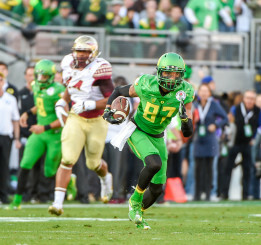 Carrington was the best receiver for the Ducks in the latter part of the season. Last year, without their best receiver in Bralon Addison, they got to witness the emergence of Dwayne Stanford, Darren Carrington and Devon Allen; not to mention Byron Marshall‘s transition to receiver and Charles Nelson making plays all over the field as a true freshman. Stanford will be a redshirt junior and both Carrington and Allen will be redshirt sophomores in 2015. Allen suffered an injury in the Rose Bowl game last season, and Carrington could miss some time early next year due to his failed drug test before the national title game. Even if Oregon is without both to begin the season, there shouldn’t be too much of a drop off at the position. Jalen Brown, a four-star recruit who redshirted last season, should see considerable playing time this season. He was in contention to play as a true freshman last season before injuring his back in spring practice. Add him to the mix and the Ducks now have six weapons for the quarterback to choose from. But we aren’t done yet. The return of Addison gives incoming freshmen more time to develop. 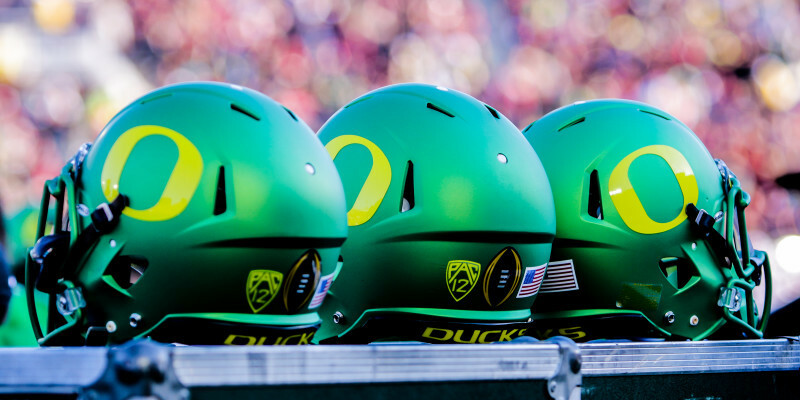 Oregon had an impressive recruiting class this season finishing with a No. 15 ranking according to ESPN. In that class is another wide receiver, Alex Ofodile, who’s name we could be getting more familiar with in the future. Check out his highlights – he looks legit. Another guy from this recruiting class to watch out for is Kirk Merritt, an athlete from Louisiana, who looks like a combination of De’Anthony Thomas and Huff. He has speed, great leaping ability, and is versatile enough to play both receiver and running back. He’s a weapon, plain and simple. Even though I think Merritt is a much better overall player than Nelson, I think the Ducks will use him in a similar way. They return five receivers who have game experience and have shown they can play. The unproven Brown will add more depth to the rotation and will more than likely see solid playing time in 2015. The incoming freshmen have great talent, but it is still too early to tell who will play and what role they will have. But all in all, the Ducks seem to have a receiving core that is more dangerous than any in recent memory. There is so much talent on this roster that there might not be enough touches to go around. That’s a problem I’m okay with having.